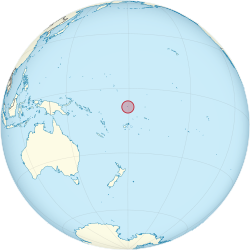 Tuvalu is a small island country in the Pacific Ocean. It used to be called Ellice Islands; it was part of Gilbert and Ellice Islands. It is a monarchy. Tuvalu is getting smaller. If the sea level keeps rising at the same rate, this country will be covered by water in about 50 years. The most important language spoken in Tuvalu is Tuvaluan. although Nuian is spoken on the island of Nui. The United States and Tuvalu signed a treaty of friendship in 1979, when the USA gave up its claim to the islands of Funafuti, Nukefetau, Nukulaelae, and Nurakita. The highest height is 4.5 metres (15 ft) above sea level, which gives Tuvalu the second-lowest highest elevation of any country (after the Maldives). Because of this, the islands that make up Tuvalu are threatened by any sea level rise. If this happens, the people will have to go to New Zealand, Niue or the Fijian island of Kioa. Tuvalu is also affected by what is known as a king tide, which can raise the sea level higher than a normal high tide. ↑ "Tuvalu: Millennium Development Goal Acceleration Framework – Improving Quality of Education". Ministry of Education and Sports, and Ministry of Finance and Economic Development from the Government of Tuvalu; and the United Nations System in the Pacific Islands. April 2013. http://www.undp.org/content/dam/undp/library/MDG/MDG%20Acceleration%20Framework/MAF%20Reports/RBAP/MAF%20Tuvalu-FINAL-%20April%204.pdf. Retrieved 8 March 2014. ↑ 2.0 2.1 "Tuvalu". Central Intelligence Agency - The World Factbook. https://www.cia.gov/library/publications/the-world-factbook/geos/tv.html. Retrieved 2009-09-04. ↑ Lewis, James (December 1989). "Sea level rise: Some implications for Tuvalu". The Environmentalist 9 (4): 269–275. doi:10.1007/BF02241827 . http://www.springerlink.com/content/7661437042415227/. ↑ "Tuvalu struggles to hold back tide". BBC News. 2008-01-22. http://news.bbc.co.uk/2/hi/science/nature/7203313.stm. Retrieved 2008-08-05. This page was last changed on 13 August 2014, at 13:08.